Blockchain is a technology for distributed database management that is instituting fundamental changes to everything from how financial markets operate to the way in which contracts are concluded. But what is it and how does it work? Here’s our beginner’s guide. Blockchain may have originally been conceived as a means for keeping track of transactions in the world’s first distributed payment system – the cryptocurrency known as Bitcoin – but it has since grown into something much more far-reaching. Its potential is so vast, in fact, that a recent survey confirmed that it may even be the biggest technological development since the conception of the internet! In this beginner’s guide to blockchain, we cover some of the basics of what blockchain is, discuss who benefits from using it, outline its security, and explain some possible drawbacks to be aware of before diving in. Think, for a moment, about a computer database. Whenever you open an account on Facebook, or send a transfer through your online banking, the information you send is being recorded on that organization’s database – which usually runs on servers using an enterprise-level database management software such as MySQL. This is centralized information management in action. It is the digital equivalent of a librarian storing thousands of public files in a physical document repository. In setups like this, the database administrator at the bank, or social network, stores and has administrative access to the database. Regular users can read and write information solely pertaining to their own accounts. If a hacker wants to target the central database in order to steal customers’ information, he must simply find a way to breach the security of that database and then conceive of a way to copy the information to somewhere he has access to without getting caught. Now consider a blockchain database. Blockchain databases are distributed, which means that they are shared, with every user in a network. This form of data architecture is known as mutual distributed ledger (MDL) – and although the cryptographic theory to run such a database has been available for several decades, it took the arrival of Bitcoin to convince the world that such a system could work in practice. In the case of Bitcoin, the information in this peer-to-peer (P2P) network is distributed to individual users via a series of intermediary servers known as nodes. These nodes perform the dual function of transmitting copies of the database to end users and using extremely complicated computer algorithms to verify the integrity of every transaction that is made within the blockchain. A ‘transaction’ need not necessarily involve the exchange of money. It may be the transmission of digital currency, the conclusion of a smart contract, or a simple record entry. 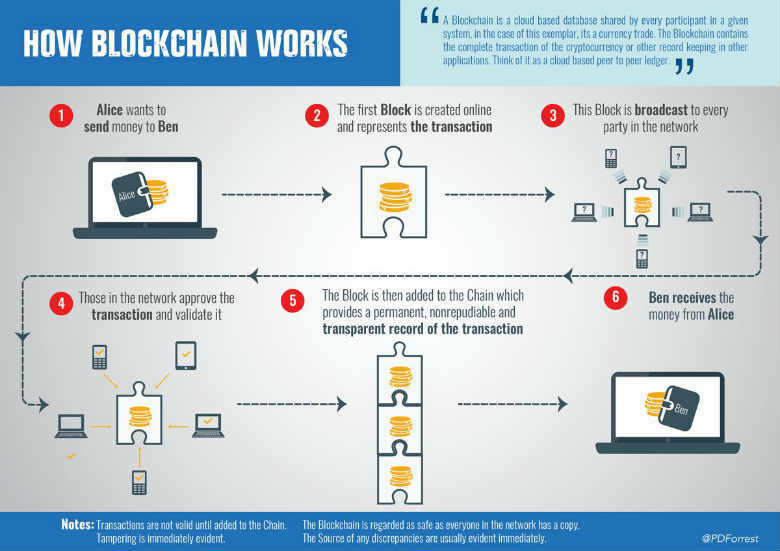 Once the validity of the transaction has been verified on the network, it is added as a block of data to the public ledger – which is hence known as a blockchain. Users can only write transactions that they make themselves of course, but unlike with a traditional, centralized database, a copy of every other change to the database is synced across the entire network on a fixed interval – often every ten minutes. • The system is virtually incorruptible: As soon as a change to the database has been verified and a transaction has been concluded, it is propagated across all users in the network. This is a continual process. Because there is no one centralized database for malevolent actors to hack into and force changes upon, the entire database is – practically speaking – incorruptible. Even if a user manages to force an unverified change onto his account, the alteration will be rejected the next time the blockchain syncs. Blockchain is a continuously self-reconciling technology. It would take more computing power than is currently available in the world for one user to forcibly override this global system of checks and balances. • There is no singular point of failure: In the above example, we saw how hackers have traditionally targeted databases for personal gain. Not only is a distributed database incorruptible, but because it is shared with a worldwide community of users, it also cannot be physically destroyed. If you’re syncing a copy of the database on your computer which subsequently catches fire, the database will live on without your hardware. Although modern centralized databases are also backed up off-site, this offers nowhere near the same level of protection that distributed technology does. As Bitcoin has recently deployed its own satellite network to beam connections to remote users from outer space, it is also conceivable that certain blockchains could even survive the destruction of the planet. Who Benefits from Using Blockchain? Now that you have a rough idea of what Blockchain is, you’re probably wondering what its practical applications are and who stands to make good from this new technology? Because blockchain is better understood as a new paradigm for storing and securing information than a database technology, use-cases are continuing to be discovered and refined as it matures. It’s hard to get far into a discussion about blockchain without mentioning Bitcoin – or other cryptocurrencies like Ethereum and Monero. Satoshi Nakamoto is the pseudonym of the anonymous creator of Bitcoin who developed the first blockchain database while searching for a technology that could provide a secure, incorruptible means for recording exchanged value without requiring a centralized financial institution such as a bank. And anyone that bought Bitcoin at its early stages can certainly be counted among blockchain’s beneficiaries. The world’s first cryptocurrency has been on a meteoric rise against fiat currencies since the start of this year and its upward trend shows no signs of abating. 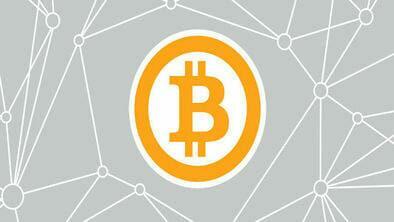 At the time of writing, 1 Bitcoin is worth close to $18,000 US dollars. At the start of the year, it wasn’t even worth $1,000. Although the rally can be expected to come to an eventual end, it will be hard to wipe the smiles off the face of anyone that bought the currency before the start of the year and has realized almost 20-fold gains. • Near instantaneous transactions: Cryptocurrencies can be transferred between digital wallets (the rough equivalent of bank accounts) practically instantaneously. Compare this to the day long waits for international wires to clear, and the benefit for those doing business internationally is hard to miss. • One currency: For those that do most of their shopping online, paying for goods and service in blockchain-backed instruments means no longer having to deal with the vagaries of the international currency markets. Travel website Expedia, computer shop NewEgg, and CheapAir.com are just some of the major providers that support Bitcoin. Even sandwich provider Subway supports now accepts it as a payment method. • Anonymous: Cryptocurrencies still have an unfortunate association with the underworld and criminal activities. And for good reason. Blockchain supports complete user anonymity, and somebody purchasing with Bitcoin never has to divulge any personal identifiable information (PII) to the retailer. This is a benefit for law-abiding users as well as cybercriminals. Blockchain, being a distributed technology, allows for creating smart contracts that theoretically don’t even need a court to enforce. By linking transactions to the fulfillment of terms – via an intermediary or escrow service – ‘smart’ contracts can create enforceable obligations for any party to a deal. To bring this into real-life terms, consider the case of a typical rental contract. Instead of having to take your wayward landlord to court to prevent him retaining your deposit after you have left the property in good condition, a smart contract could create systems to make all of this happen digitally. The term requiring the release of the deposit could be coded in to the rental agreement. Then, if an independent entity, such as a rental agency, can be relied upon to verify that the tenant has fulfilled his side of the deal, the smart contract can be digitally concluded and the deposit automatically released back to the tenant. One of blockchain’s unique features is that it does not require much in the way of traditional infrastructure to operate. That makes it the perfect vehicle for getting vital assets – such as money – to countries where reliable infrastructure to ensure transfers may either not exist or have been degraded to the point of non-functionality by problems such as systemic corruption. The United Nations World Food Programme (UNWFP) was able to take advantage of this features to transfer the Ethereum cryptocurrency to 10,000 refugees in war-torn Syria. Thanks to Bitcoin’s development of a satellite network to place nodes in outer space – a move which other providers can be expected to emulate – this also means that money can be reliably transferred to countries that do not even have a reliable infrastructure for connecting to the internet. Although distributed database systems like blockchain are considered virtually incorruptible and cryptographically secure, there are still some concerns that potential users should be aware of before pouring their life savings into the next blockchain-backed asset or startup that catches their eye (not that we advise this!). Asset retrieval can be difficult: Anyone who has read Wired writer Mark Frauenfeld’s account of almost losing $30,000 worth of Bitcoin has gotten a good glimpse into how difficult it can be to regain access to lost blockchain-based assets. In a traditional database model, there’s a central administrator (or his agent, on a helpline) to call for matters like PIN retrieval and to show sufficient evidence to regain access to assets. Blockchain-based databases, on the other hand, remove that one more reliable – but more vulnerable – individual with access to an entire database and replace him with a faceless cloud of users and nodes. Those that need easy solutions to recover lost transactions will probably want to wait for the community to work out some kinks in the blockchain concept. 51% Attacks: Theoretically, if one node operators could provision 51% of the total number of nodes in a blockchain network, a “lie” could successfully propagate into the blockchain. This is an inherent flaw in the blockchain model. Serious network operator are therefore closely monitored by the community to ensure that this scenario doesn’t play out. There are some obvious drawbacks to blockchain technology that deserve more attention. Electricity consumption: The technical infrastructure needed to operate blockchain-based systems is gargantuan in proportion. Blockchain systems currently require a global network of “miners” to solve increasingly difficult cryptographic challenges that ensure the safety and integrity of the overall exchange system. What’s less well-known is that vast amounts of electricity are needed to power the computing resources needed to solve these digital puzzles. In fact the amount of electricity that has been expended on mining just this year eclipses the total consumption of many African countries. It’s still experimental: Bitcoin, the first major blockchain-based technology, has been around for less than ten years. Major fiat currencies such as the US dollar, by comparison, date back centuries. Most blockchain-based technologies remain at an early stage of experimentation. Indeed, the whole concept of a distributed ledger to record value is its in infancy. Blockchain technology users would be well-advised to regard the technology as experimental while it remain in its early days. Spotty or non-existent regulation: How to regulate blockchain-based exchange systems and instruments is an issue that regulators are only beginning to wrestle with. Some countries, such as China and South Korea, have taken draconian approaches and banned important means of developing new blockchain-backed systems such as initial coin offerings (ICOs). While blockchain systems have plenty of inherent security, a second regulatory layer may be missing entirely for many users. Blockchain is an amazing technology with the potential to revolutionize major facets of life. However, it has does not come without drawbacks and several important security limitations require addressing. Next > Ajit Pai and the FCC Repeal Net Neutrality - What do We Gain and Lose?